Camille Pissarro (1830–1903), Rue Saint-Honoré, Sun Effect, Afternoon (detail) (1898), oil on canvas, 65.4 × 54.6 cm, Nelson-Atkins Museum of Art, Kansas City, MO. Wikimedia Commons. Camille Pissarro is probably the ideal ‘core’ French Impressionist whose work shows the evolution of figures in landscape paintings during the latter half of the nineteenth century. As one of the landscape specialists among the Impressionists, the great majority of his works are pure landscapes. He did paint some figurative works, and some fine ‘rural genre’ scenes with motifs similar to those of Jules Breton, even his own take on gleaners, but these are readily distinguished. Camille Pissarro (1830-1903), Two Figures Chatting by a Roadside (1856), oil on canvas, 46.3 x 38.1 cm, Richmond Virginia Museum of Fine Arts, Richmond, VA. Wikimedia Commons. 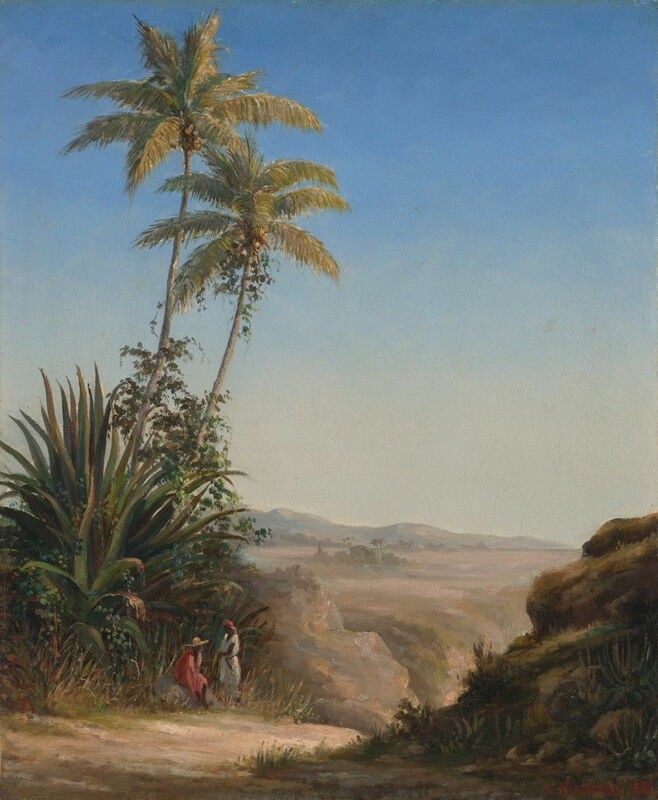 Before he left his native Caribbean for France, Pissarro was painting in fairly conventional realist style, as shown in his Two Figures Chatting by a Roadside (1856). Although the title of this painting, the two figures are no more than staffage for this fine landscape. 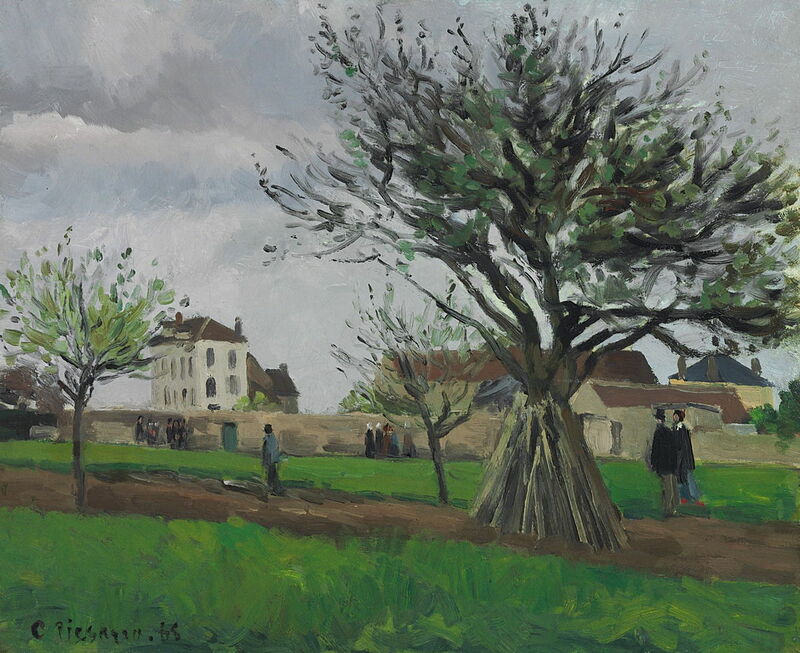 Camille Pissarro (1830-1903), Apple Trees at Pontoise, the House of Père Gallien (1868), oil on canvas, 38.3 x 46.4 cm, Private collection. Wikimedia Commons. In his few surviving paintings made before the Franco-Prussian War, as his style rapidly became more painterly, so his figures became more roughly formed. They remain pure staffage, both in Apple Trees at Pontoise, the House of Père Gallien (1868) above, and his many views of the roads around Louveciennes, in the two paintings below. 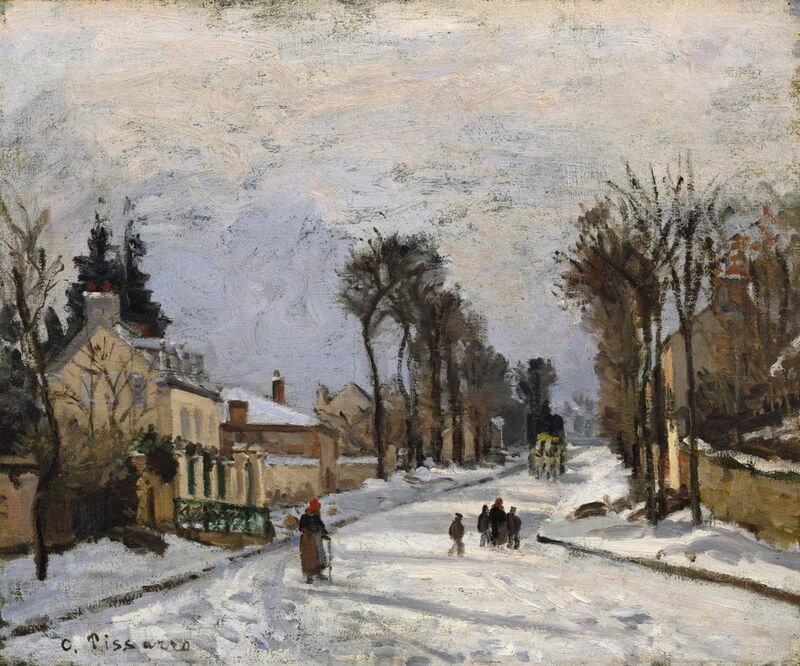 Camille Pissarro (1830–1903), Road to Versailles at Louveciennes (Snow Effect) (1869), oil on canvas, 38.4 × 46.3 cm, Walters Art Museum, Baltimore, MD. Wikimedia Commons. Camille Pissarro (1830-1903), Route de Versailles, Louveciennes, Winter Sun and Snow (c 1870), oil on canvas, 46 x 55.3 cm, Museo Thyssen-Bornemisza, Madrid. Wikimedia Commons. 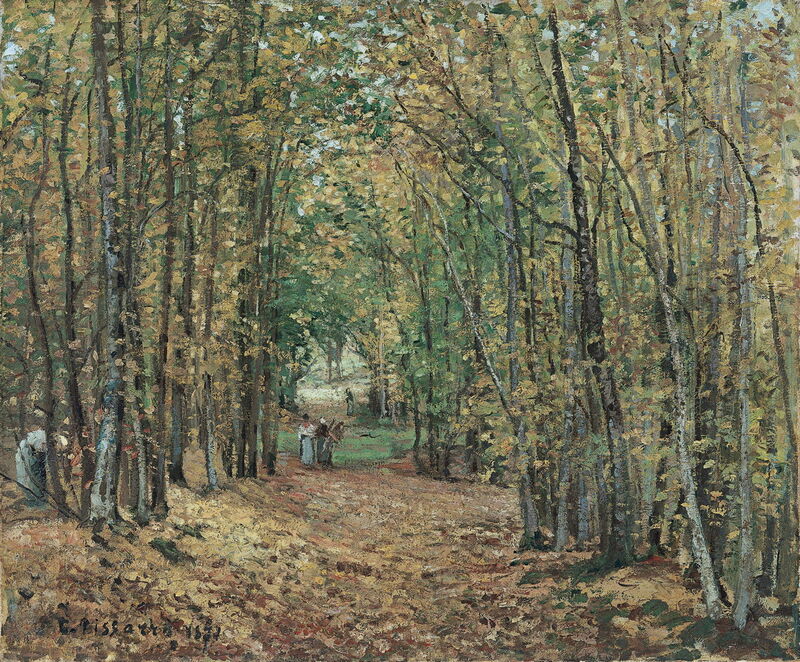 Camille Pissarro (1830-1903), Avenue in the Parc de Marly (c 1871), oil on canvas, 45 x 55 cm, Museo Thyssen-Bornemisza, Madrid. Wikimedia Commons. 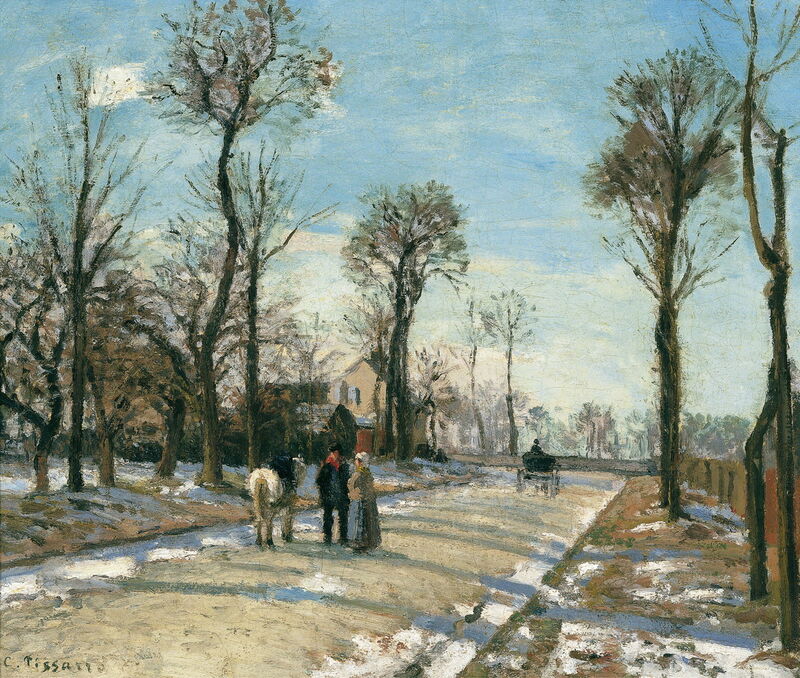 Pissarro used figures to draw the eye into a painting, as in Avenue in the Parc de Marly (c 1871) above, and to add quite substantially to the overall effect of the painting, as shown in Hoar frost at Ennery (1873) below. Camille Pissarro (1830-1903), Meadow at Bazincourt (1885), oil on canvas, 46 x 55 cm, Private collection. Wikimedia Commons. In Pissarro’s huge series of works showing the countryside around Bazincourt and Éragny, there are many which contain figures, and many which don’t. The construction of these figures changed along with his style, from the high Impressionism of Meadow at Bazincourt (1885) above, to the more Neo-Impressionist The Steeple and Manor-House at Éragny, Sunset (1891) below. Camille Pissarro (1830-1903), The Steeple and Manor-House at Éragny, Sunset (1891), oil on canvas, 32.5 x 41 cm, Private collection. Wikimedia Commons. 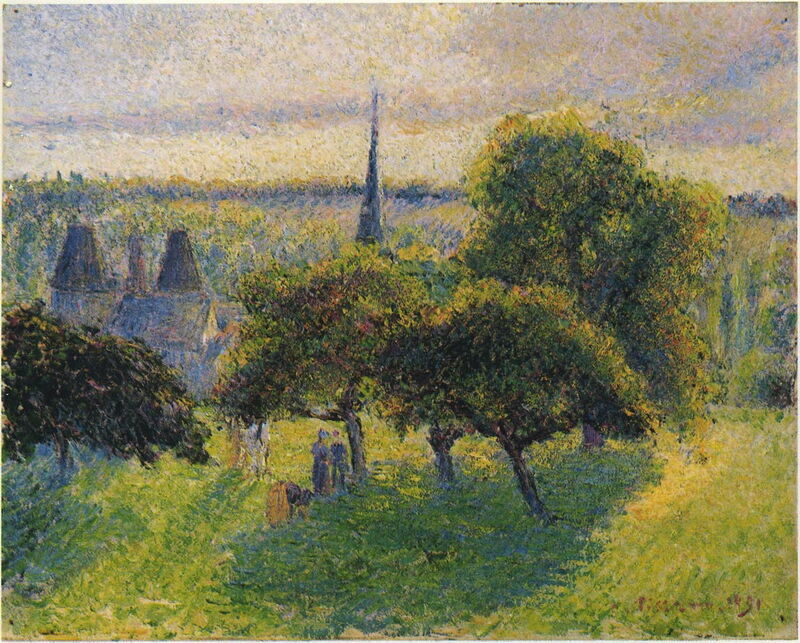 Camille Pissarro, Saint-Charles, Éragny (1891), oil on canvas, 81 x 65 cm, Clark Art Institute, Williamstown, MA. WikiArt. Even his most radical and brilliant landscapes often contain a figure or two – in the case of this view of Saint-Charles, Éragny (1891) a few broken strokes in a different rhythm, drawing the viewer deep into the rich colours and textures made by his marks. Camille Pissarro (1830-1903), The Big Walnut Tree in Spring, Éragny (1894), oil on canvas, 60 x 73 cm, Private collection. Wikimedia Commons. Pissarro’s staffage sometimes used contrasting colours to extend the range of hues on the canvas, adding interest and variation. In most, like The Big Walnut Tree in Spring, Éragny (1894) (above) the figures remain quite small. Camille Pissarro (1830–1903), Morning Sunlight on the Snow, Éragny-sur-Epte (1895), oil on canvas, 82.3 x 61.6 cm, Museum of Fine Arts, Boston, MA. Wikimedia Commons. Occasionally, a landscape like Morning Sunlight on the Snow, Eragny-sur-Epte (1895) starts to cross over into a genre scene, here showing a poorly-dressed country woman carrying a couple of pails in the snow. I could equally have traced similar changes in the figures of Monet’s or Sisley’s landscapes over this period. 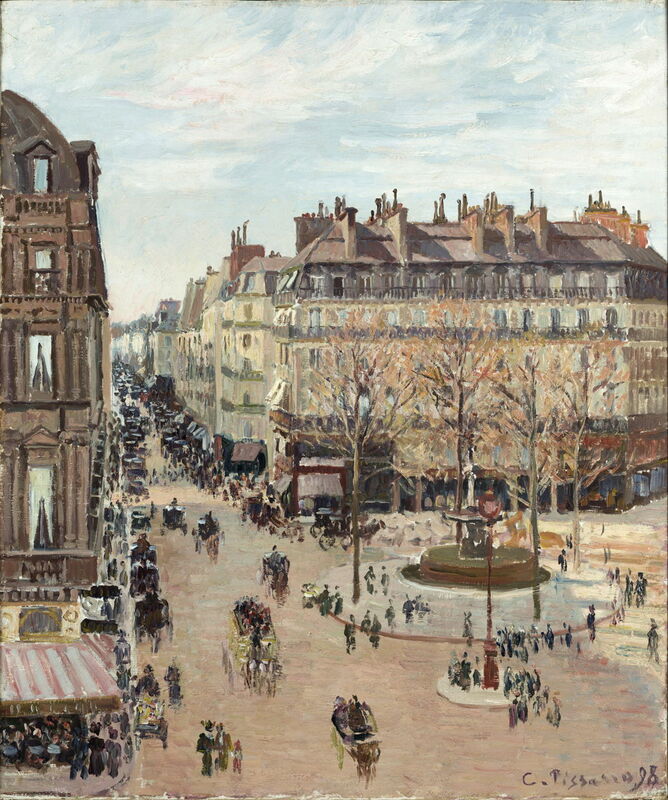 Where Pissarro is more unusual is in his urban series which he started painting in the late 1890s. Camille Pissarro (1830–1903), Boulevard Montmartre, Spring (1897), oil on canvas, 65 x 81 cm, Private collection. Wikimedia Commons. 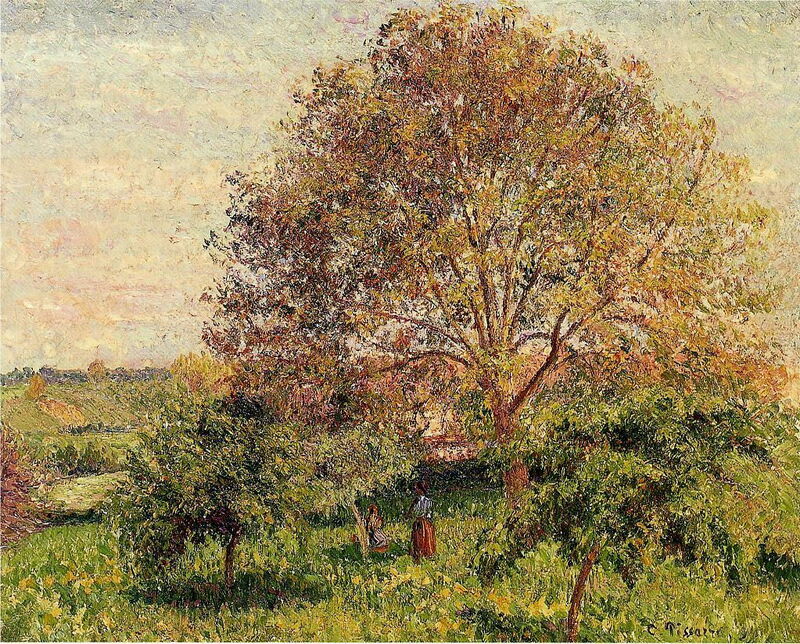 Around Bazincourt, Pissarro has shown us many trees, few buildings, and the occasional figure. 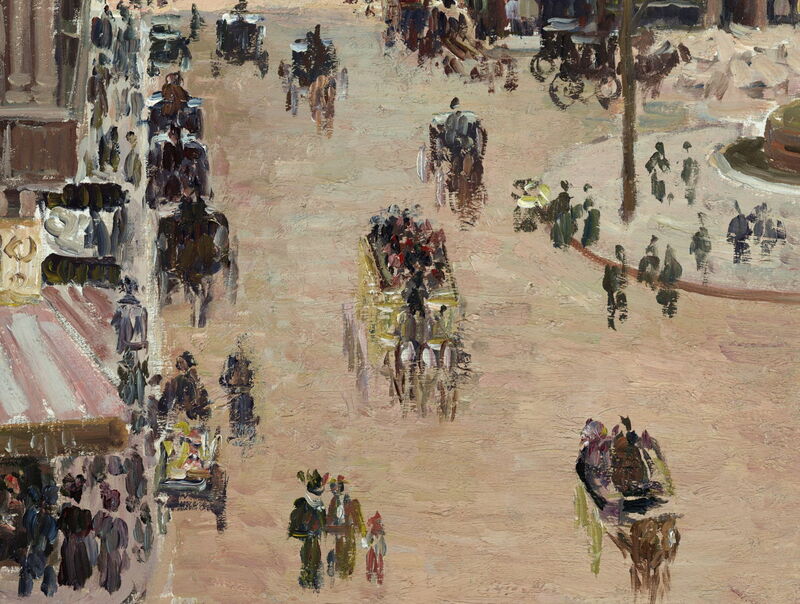 In his Boulevard Montmartre, Spring (1897), the balance has changed completely: this is a landscape composed primarily of buildings and streets, a plethora of figures, and countless carriages to move those people around. As with Richard Parkes Bonington’s Fishmarket near Boulogne, the figures are an integral part of this landscape. Camille Pissarro (1830–1903), Boulevard Montmartre, Spring (detail) (1897), oil on canvas, 65 x 81 cm, Private collection. Wikimedia Commons. 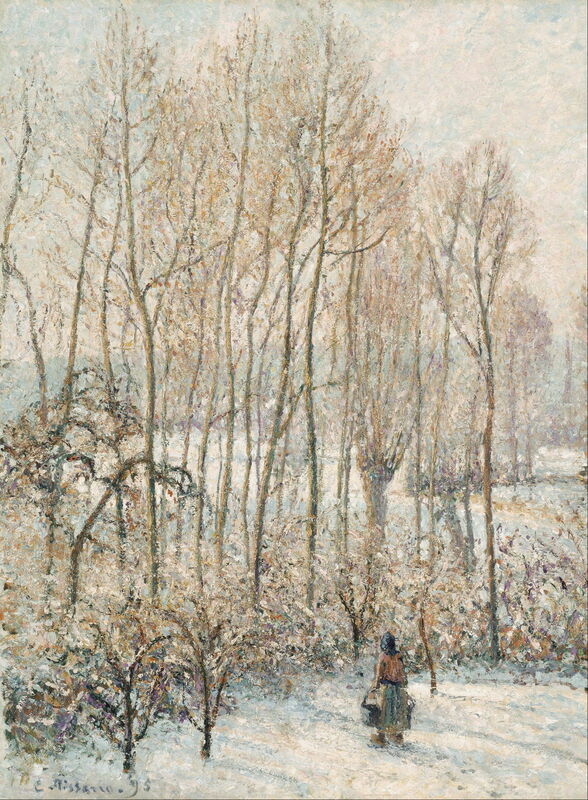 In the foreground, Pissarro may have formed each quite roughly, but he has painted in sufficient detail. Three white horses range in tone and colour, with highlights on the front of each head. You can see which people are wearing hats, and spot ladies in their fashionable clothing. 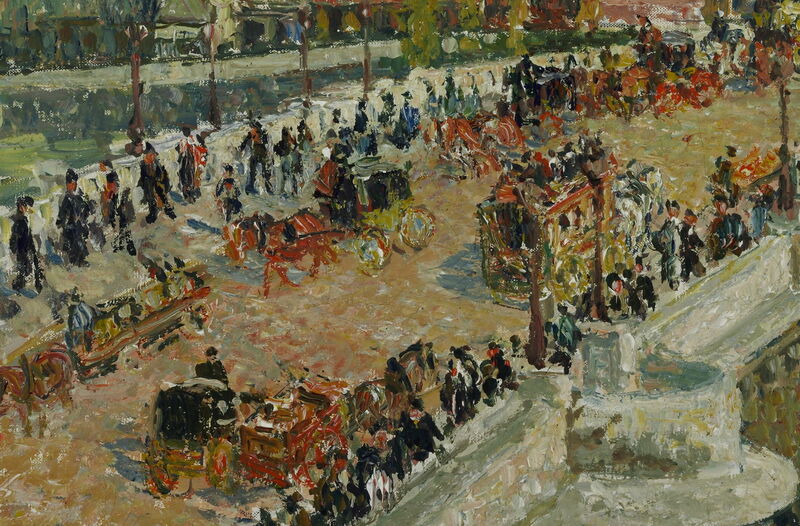 Deeper into the distance, detail is lost, and the carriages and crowds merge into one another. Still they have a rhythm, highlights and shadows, and form. 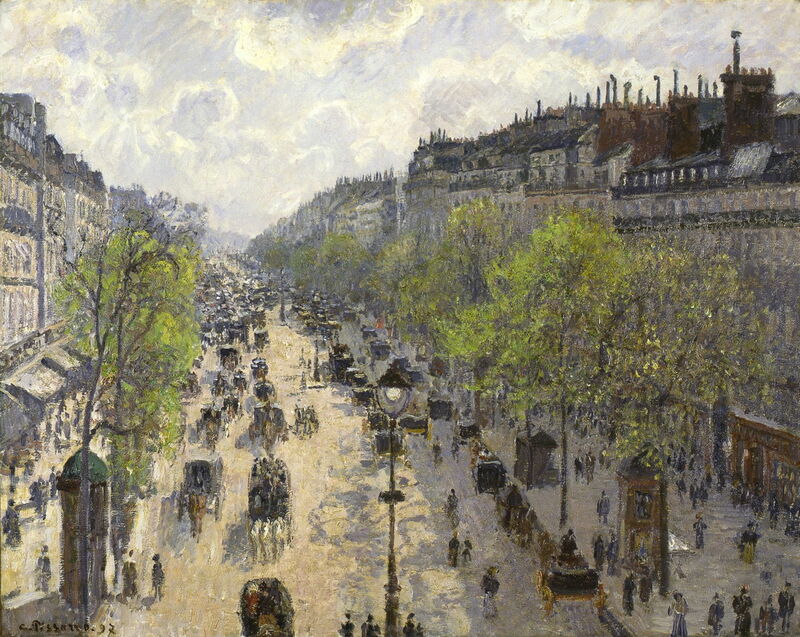 By this stage in his career, Pissarro was clearly an incredibly rapid and efficient painter. These marks, which we resolve into tiny objects in the distance, must have been painstakingly formed from strokes and splodges of paint, at a very brisk rate. Monet and other Impressionists did the same at various times, but only Pissarro constructed long series showing the crowded streets of Paris. He must have spent day after day at his hotel window populating these busy streets. Camille Pissarro (1830–1903), Rue Saint-Honoré, Sun Effect, Afternoon (1898), oil on canvas, 65.4 × 54.6 cm, Nelson-Atkins Museum of Art, Kansas City, MO. Wikimedia Commons. 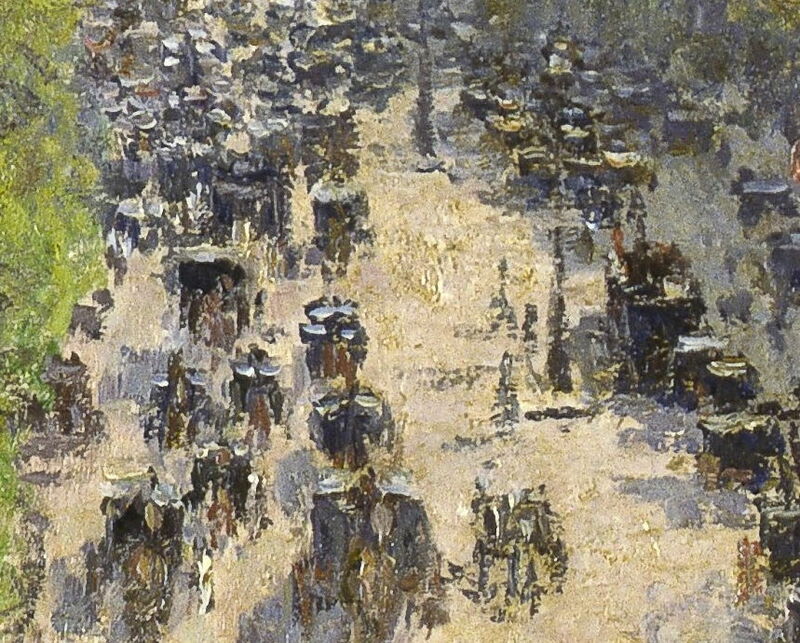 In his Rue Saint-Honoré, Sun Effect, Afternoon (1898), the human throng is more scattered, and the carriages and figures in the foreground rather larger. 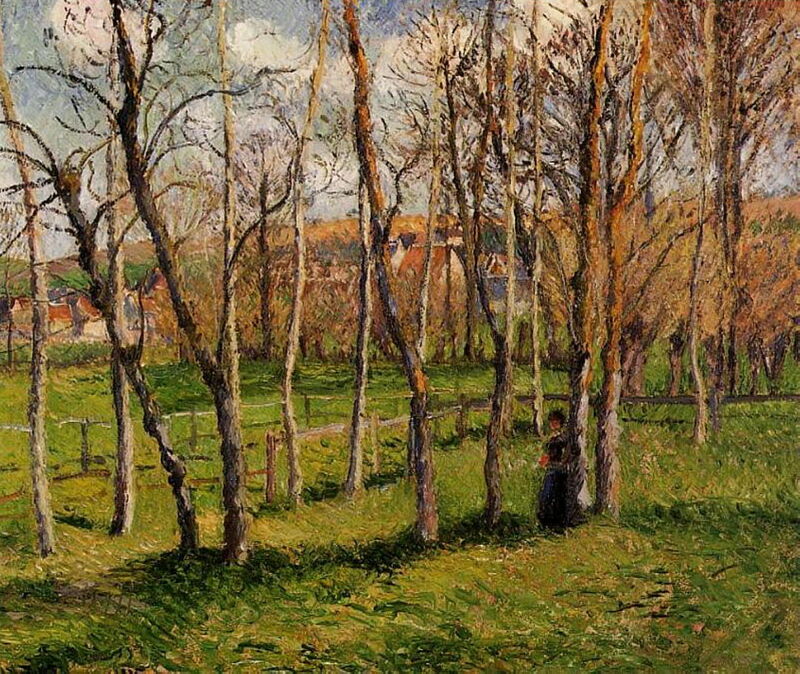 Pissarro accordingly forms his blots and strokes to deliver more detail. A few carefully-shaped brushstrokes of a mid-browny-grey, and there’s a woman wearing an elegant hat, with a waist in her long coat, carrying a bag. The carriages have wheels, and there is a charabanc, with a group sat in the open on top. Every stroke, dot, splodge gives the visual cortex of our brains just enough information to see in our mind the detail of an object, for it to be recognisable, even though much of what we see is hardly there on the canvas at all. This is miraculously perceptive painting: knowing exactly what, and how much, to hint at, so that our minds will fill in the rest. 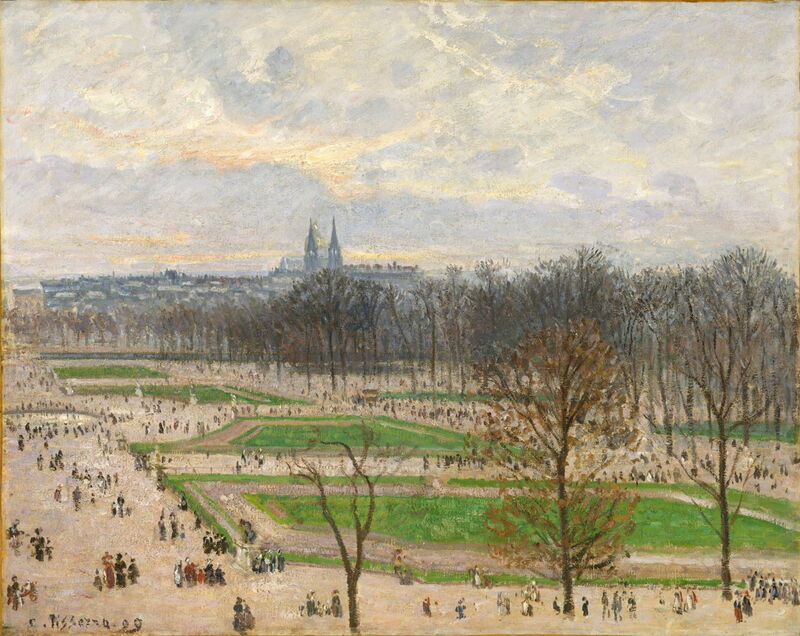 Camille Pissarro (1830–1903), The Garden of the Tuileries on a Winter Afternoon (1899), oil on canvas, 73.7 × 92.1 cm, The Metropolitan Museum of Art, New York, NY. Wikimedia Commons. We see the same effect in the crowds fading into tiny specks in the distance of The Garden of the Tuileries on a Winter Afternoon (1899). 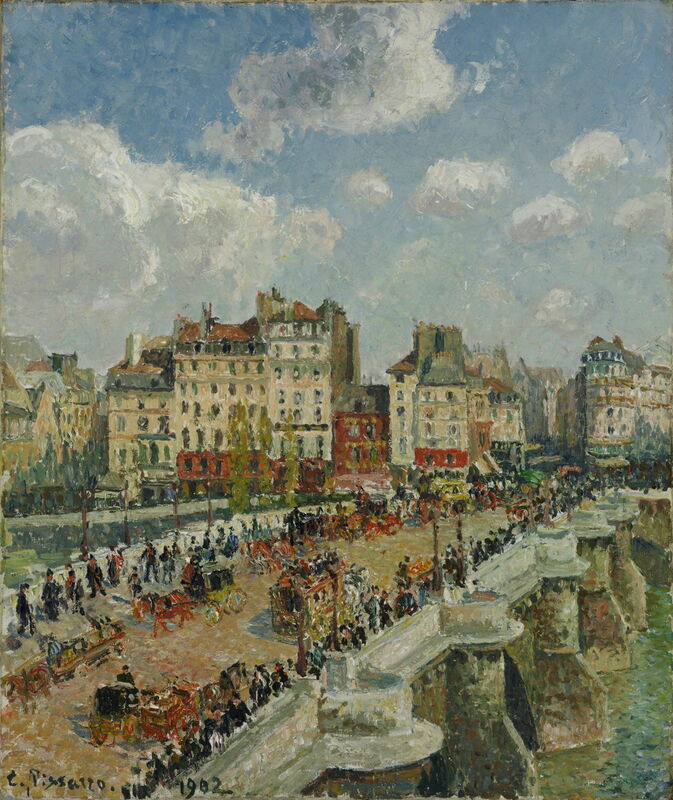 Camille Pissarro (1830–1903), The Pont-Neuf (1902), oil on canvas, 55 x 46.5 cm, Szépművészeti Múzeum, Budapest, Hungary. Wikimedia Commons. Just a year before his death, Pissarro painted this amazing view of the crowds on The Pont-Neuf (1902). 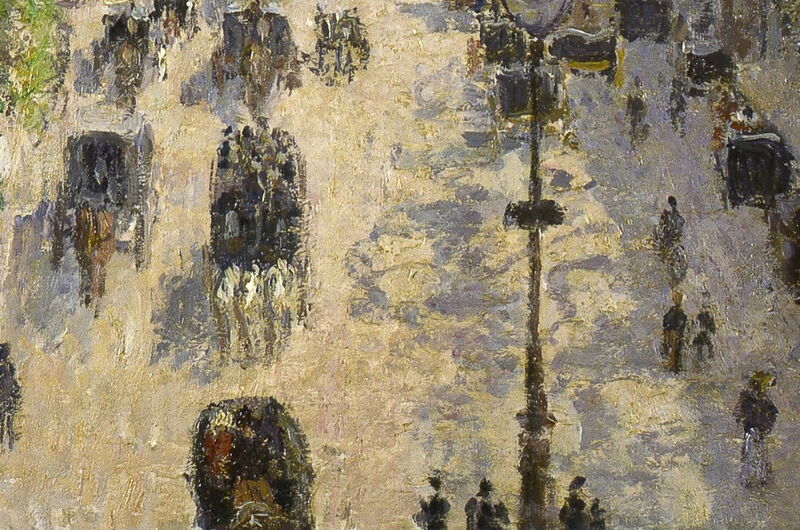 Camille Pissarro (1830–1903), The Pont-Neuf (detail) (1902), oil on canvas, 55 x 46.5 cm, Szépművészeti Múzeum, Budapest, Hungary. Wikimedia Commons. Many here even have faces, with different skin complexions. There’s a brown horse harnessed in to a posh-looking green-gold and black carriage, another charabanc with a sub-crowd on its open top, and dozens and dozens of pedestrians. For the last few years of his life, Pissarro painted something new: human landscapes in which the figures are the landscape. We have seen them here in Paris; they were to come to New York, London, and other major cities too, in paintings by Colin Campbell Cooper and George Bellows. 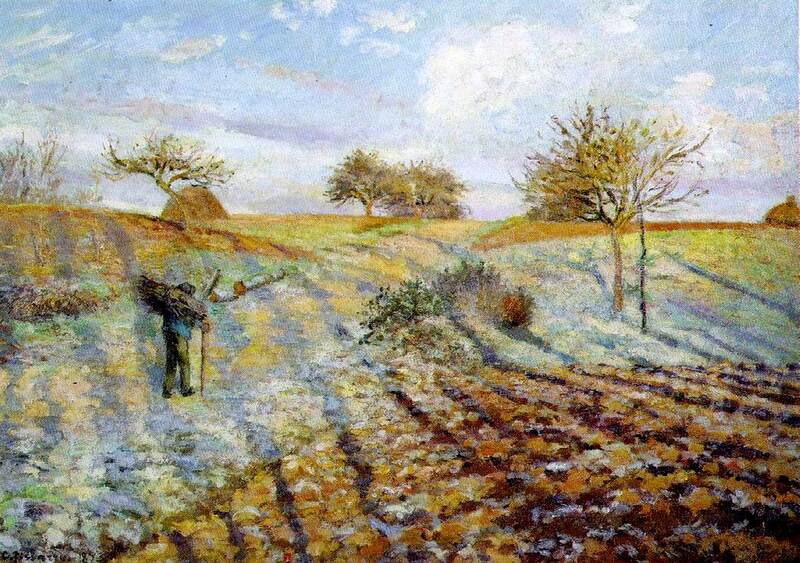 Pissarro’s series paintings (this blog): here and here. 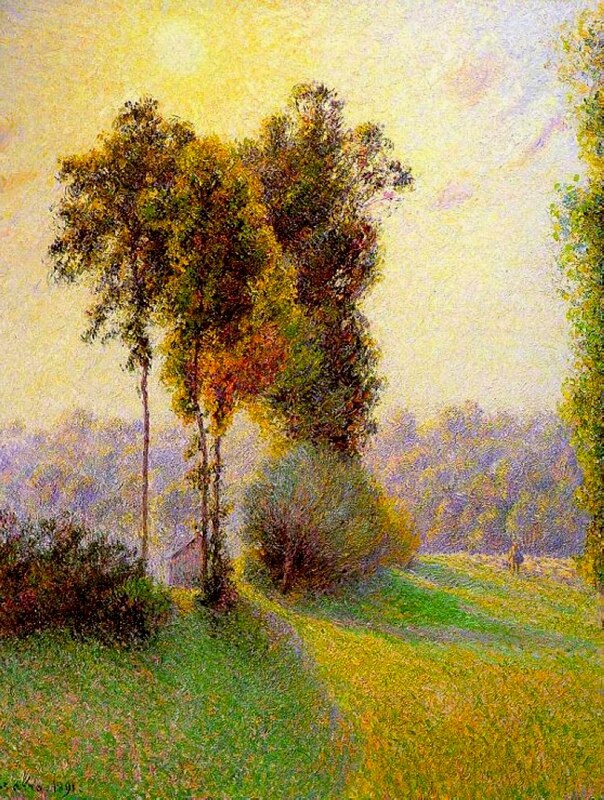 General account of Pissarro’s work (this blog). Posted in General, Painting and tagged Bellows, cityscape, Cooper, figures, Impressionism, landscape, Monet, painting, Pissarro, Sisley, staffage. Bookmark the permalink.